The Spanish region of Catalunya, different in character from much of the restof Spain, consists of 4 provinces having a wide range of landscapes, coastlines and activities for the tourist. The region has its own language, Catalan which is in general use (though most will also speak Castillian Spanish) and many places have more than one name or spelling. With the Costa Brava (Rugged or Wild Coast) as its coastline with sandy bays and the Pyrenees in its North Western corner Gerona province has long been a popular destination. On the coast, Blanes and Lloret de Mar are both well developed resorts within easy reach of Barcelona, while further north there are many smaller destinations. Inland to the north is the large town of Figueres, which being the birth place of Salvador Dali, has a museum of his work (the second most visited museum in Spain), while the city of Gerona, sitting on the banks of the river Onyar, has a medieval quarter and an impressive Gothic Cathedral. Gerona province can be accessed via the airport at Gerona or the French airport of Perpignan offers an alternative for the more northern parts. With the Southern end of the Costa Brava and the Northern end of the Costa Dorada, including the popular resort of Sitges, and of course, the city of Barcelona in between (surely on everyone's list of "must visit cities"). Barcelona city has the stunning architecture by Gaudi, the beatiful old town around the cathedral with ist narrow streets andenticing shops, the Ramblas with it's bars, street entertainers and artists, plus plenty of museums and art galleries to keep you occupied. Barcelona can be accessed by Barcelona airport. 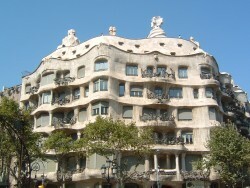 We have self catering holiday rentals in Barcelona in or near the following towns. The Tarragona coast line is known as the Costa Dorada (golden coast) with long sandy beaches, often having pine trees behind, has been a popular holiday destination for the Spanish and British. For those who want something more, there is the massive them park of Port Aventura near Tarragona and the nature park of the Rive Ebro Delta, being one of the most important wetlands in the western Mediterranean and home to a large range of waterfowl species, including flamingoes. Tarragona City has a wealth of Roman remains including an amphitheatre and aquaduct, having been a major city of that time. 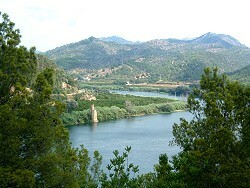 Tortosa, the main town in the south of Tarragona province sits on the river Ebro and is well worth a visit,along with the entire Ebro valley. 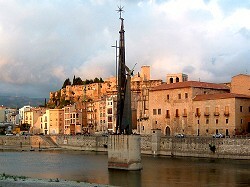 Tarragona can be accessed by Reus Airport. 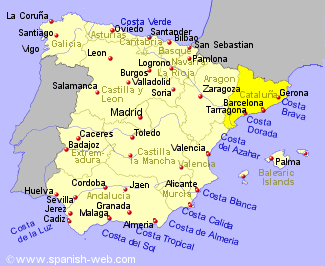 We have self catering holiday rentals in Tarragona in or near the following towns.